Don't you love an old-fashioned bake that doesn't require plugging in the stand mixer? Just use a pastry cutter to cut the butter into the oatmeal, flour, and brown sugar mixture. The butter should be cold but I can confirm that it works well if the butter is chilled but not rock-hard. This way, it makes breaking down the butter into coarse bits a whole lot easier. When I saw the mixture in my big bowl, I was worried that maybe I should have used a larger baking pan after all. 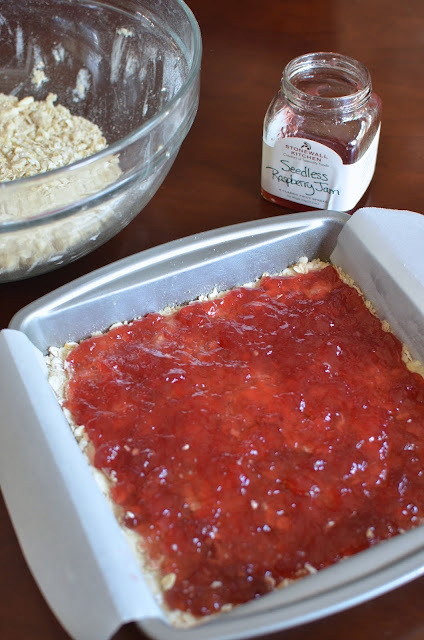 However, once you pack half the mixture into the bottom of the pan, layer on the jam, and add the second-half on top, you'll see it all fits and the result will be about 1-inch tall bars. It took right about 35 minutes for my pan of oatmeal bars to be golden brown and ready. A little bit of the raspberry jam bubbled up and out of one corner. It all smelled intoxicating. The dark brown corners are extra crunchy and delicious. Let the oatmeal bars cool in the pan. Then I lifted the whole thing out of the pan using the parchment overhang and sliced them into 16 bars. They are a treat to share and savor. * Instead of raspberry jam, you could another kind such as strawberry or apricot. Preheat oven to 350 degrees. Butter a 9-inch square baking pan (this makes about 1-inch thick bars; you could use an 8-inch or larger 9x13 inch pan depending on whether you want a thicker or thinner bar). Line the pan with a piece of parchment paper, allowing about 2 inches of overhang on either sides. Grease the paper as well. In a large bowl, mix together the flour, oats, brown sugar, baking powder, and salt. Cut the butter into the dry ingredients using a pastry cutter until you have a coarse meal. Take half the mixture and place it into the prepared pan. Press the mixture into the pan to make an even packed layer. Gently spread the raspberry jam evenly on top using an offset spatula. Sprinkle the remaining half of the oat mixture evenly over the top and just lightly pat it into the jam. Bake until golden brown on top, about 30-40 minutes. Remove from the oven and let cool in the pan. Once cooled, lift bars out of the pan using the parchment overhang. Cut bars 16 bars/squares using a serrated knife. You know I completely embrace you philosophy of sharing home baked love, Monica. Baked goods simply taste better when love is baked in. :) I bet your lucky friends were delighted with these bars! 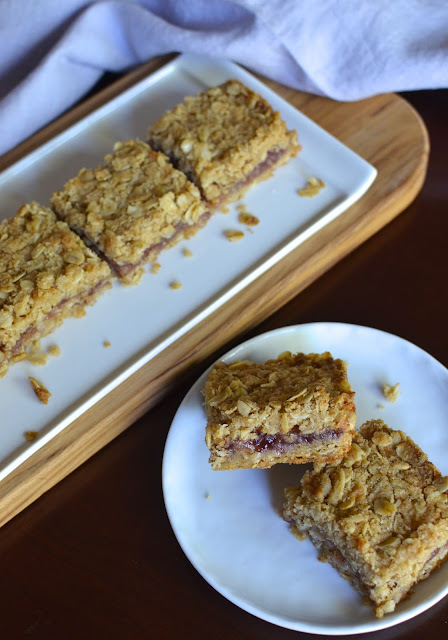 A fruity, chewy oat bar and the company of friends must have made for a great day! Yes, I can't imagine these at about half this thickness. Oatmeal bars - with oats and brown sugar and all that buttery goodness...it's hard not to like. You have me long for some oaty treats. These bars look terrific! What would we do without oatmeal. It's one of *the* greatest things! Bars like this are my absolute favorite - and these sound awesome with the raspberry jam! I love how few ingredients are needed too - and I usually have everything in the house! Win! It really did smell intoxicating! : ) Thank you...I was glad they turned out into these 1-inch bars using the smaller pan. haha - you said it! Oatmeal bars are my favorite! I feel like they're so wholesome. I generally make mine with blueberries or blueberry preserves so I'm digging this raspberry twist! I always think 'red' for whatever reason when I'm thinking these kinds of bars. Blueberry preserves sound very, very good! I love raspberry oatmeal bars! The height of your bars looks perfect. My kind of cake, I love this kind of bars, preferably with some really sour jam....:) Yummy! Now you have me thinking of lemon bars when you said 'sour...' Yum! omg. I love this cake! so healthy and delicious! The smell was incredible. Big side bonus. These bars look divine! I love seedless raspberry jam, it's my favorite jam! I LOVE these kinds of bars - they're kind of like a fruit crisp except super heavy on the oat topping (which is the best part). I wish I had a square to enjoy right now! That is *exactly* right! It's very much like the best part of a fruit crisp, intensified! : ) Thanks, Amanda! I love raspberry jam! These bars look so good! I wish that I live near you. I don't know anyone who bakes and cooks well like you in my neighborhood (there's a guy who smokes meats really well though), and it's bummer. I can totally imagine the smell in the house like you described... I wish I was in the kitchen with you. I could totally dig in after it's been done! Sounds delicious! It's probably good for your waistline that there are not too many bakers in the neighborhood. I know many a wonderful thing comes out of your kitchen so no worries. ; ) Hope all is good and you are enjoying your new kitchen! There is a bakery called Bien Cuit in Brooklyn and when I learned the meaning, "well-done", I thought it was genius because it's often the browned, "well-done" parts that are the tastiest in many baked goods/pastries/breads. I loved the well-browned bits here.